Sorry I haven’t posted for a couple of days. Between being away for a conference and then rushing back to hang the portraits in “Offshore cafe’s” exhibition space there hasn’t been time. On Friday night Catherine and our dear friends Gerry and Elisabeth got stuck into the task and discovered the true scale of hanging100 12″ x 9″ images; 500 sticky pads needing cut, 100 name and description cards as well as wrestling with newly painted walls where the paint has set with a powdery finish. A big thanks to my helpers. I wen’t back yesterday and finished the job as we only managed 70 on Friday night. 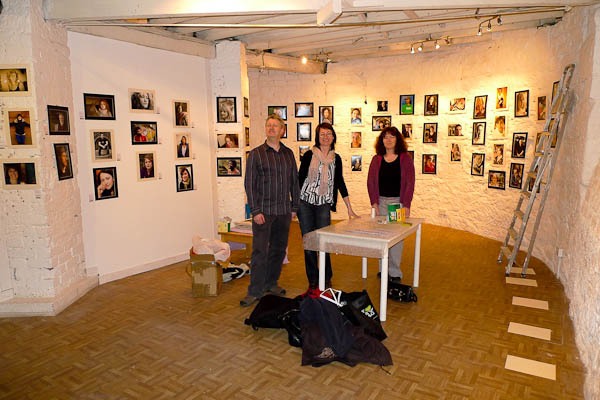 Anyway, the exhibition is up, and I’m really pleased to see it coming together. If you’re near Glasgow then head to Offshore Cafe, Gibson Street in Glasgow’s west end. Looks good – best of luck.